Morning can’t come early enough. 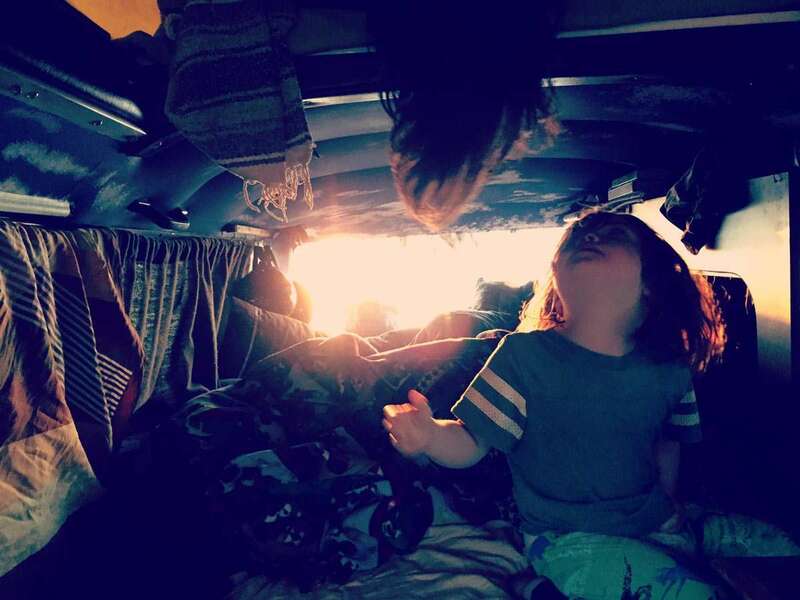 I rustle around in the mishmash of blankets left over from the previous seven hours of sharing the top bunk of our Bus with my soon-to-be 5 year old son, Winter, and hope the glow of sunrise will illuminate the yellow canvas sides of our pop top. It goes straight up, unlike a Westy’s tilt top style, and so there is nowhere in the top bunk where an adult can sit up. I just want to wriggle around in the sheets anyway, reveling in the 5am and trying to soak up every last drop of whatever heat our little propane heater’s life has left this morning. I hear the sound of a dog barking, and am glad it’s not ours. Wylder, the youngest brother sleeping with his mom below, lets out a groaning shrill wrong side of the bed style “Maaaamaaa!” then immediately realizes he’s not only in the same bed with her, but that’s it’s not even as large as a twin and he is at all times in immediate contact with her. I imagine he thinks, falling fast back to sleep, “Got her!”, taunting me at having stolen my woman. A slow half an hour or two later both of the younger boys are fed. Yogurt and milk fit nicely into a small 12 volt fridge that barely comes up to my knees but can hold essentials like a kid holds onto a lollipop. Strawberries nearly freeze in there, and as it’s the primary thing we’re using our two marine batteries to power, days can go by with no sun and it’ll still go strong. In cold weather at least. Before we had solar, I’d just run the fridge directly to a battery and let it go until it ran out of juice. Those nights we’d stay somewhere with electric, which also typically means showers. Two birds, one stone. When it’s chilly, the fridge could stay cold eternally thanks to a natural lack of insulation. And mornings as of late, it’s cold. Luckily, we’ve collected many blankets over the years. A pot of hot water boils on a little two burner camping stove constantly all morning. First batch of coffee. Second batch of coffee. Hot water to do the dishes. Renée, their lovely mother, tries to dress Winter first. He’s difficult, so she moves onto Wylder, who in turn pulls the same shenanigans. At some point they’re both wearing half as many clothes in some configuration as is typically appropriate for the season and/or society, when finally Winter is all set and ready to go. He’s out through the shotgun door and off to wake up Tristan, our 14 year old. Tristan sleeps in a tent. He’s got a cot and two sleeping bags and two pillows and two additional blankets. He has slept through some fiercely cold nights with that gear and has always been warmer than us. 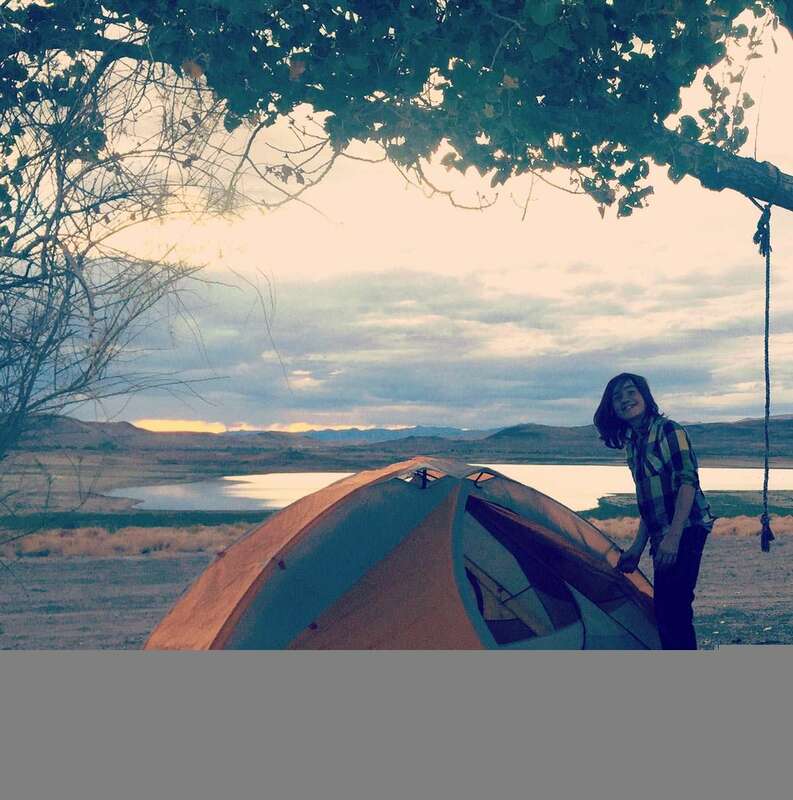 “I wrap the blankets around my head, but I don’t wear a jacket,” he tells me one evening, ready to stand under the stars and chat with me before bed rather than retreat to what might prove to be the last night of cell reception for days. If you’ve ever known a Millennial, that’s love right there. Sometimes his tent can stay up for days. Sometimes it’s a “set it up tonight, tear it down in the morning when it’s raining and there are fire ants by the thousands beneath it” situation. But it’s his room and while he genuinely seems to love being in there, the last thing he ever wants to do while in that tent is wake up. Which makes Winter the perfect candidate for the job, all too loud at now 8:30am and pulling on zippers and falling into the rainfly. 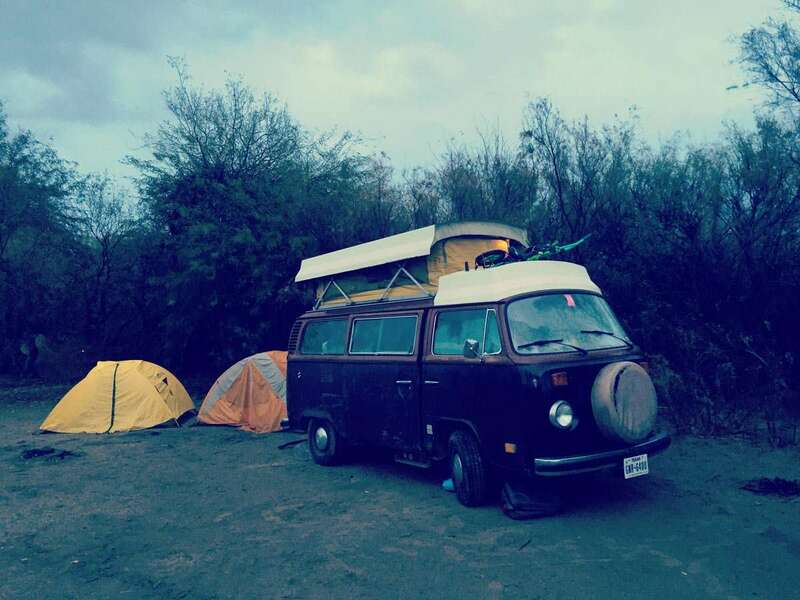 The Bus is two personalities: a cozy tinyhome and a trusty adventure of a vehicle. But they must Jeckyl and Hyde between one another, never to live fully simultaneous in the same world. So we also have a second tent that we use occassionally. This is my old backpacking tent which has served me as well in some dark forest as it has performed in its new role as “shed”. When we’re set up at camp, things like car seats and suitcases go in there. Items that we don’t want cluttering up our living space all the day and night long. Plus, it’s a way fun fort for the younger boys when they get tired of the other fort that they call home. We make up names for every speck of storage we’ve got. Well, I do. I just made up “the shed”, but I’ll tell everyone in the morning and they’ll agree. Or ignore me. Both are pretty typical. There’s the garage, a 2′ x 3′ compartment near the back which houses actual camping gear and essentials like oil and our jack. Then the closet, a similarly spaced area just ahead which has the sole purpose of housing clown car amounts of blankets. Our pantry, large enough to hold exactly five plates, five bowls, two coffee cups, four kids cups (extravagant I know), a pot and a pan and our coffee maker, plus enough food for maybe three meals if we’re lucky. Most of our food is either some type of dairy or meat in the fridge or fruits and bread in a basket on the counter. A similar assortment of one each spoon and fork for all of us, a single knife, a spatula and some loose change lives in the drawer. There’s also a cupboard but it’s full of rather boring items. Still, it’s fun to be able to say “the drawer” and not have the response “which one?” be viable. Once the bed is transformed to a backseat, the stove modified into a middle row and all of our gear stowed neatly into the back of it all, we pull down the top and fire her up. When I first bought the Bus, she didn’t start regularly. 50/50 would be pushing it. Since then she’s had a new short block, new axles, clutch, batter(ies) and terminals and a chunk of random in-betweens. I’ve also learned to wrench on this old Lego pile of an engine enough to feel adequate in most situations. Just today I was running from gas station to gas station looking for good beer in a town which did not take kindly to anything that wasn’t Budweiser and eventually she wouldn’t start. It was literally 13 seconds to run to the back, assess the situation and be back on the road. 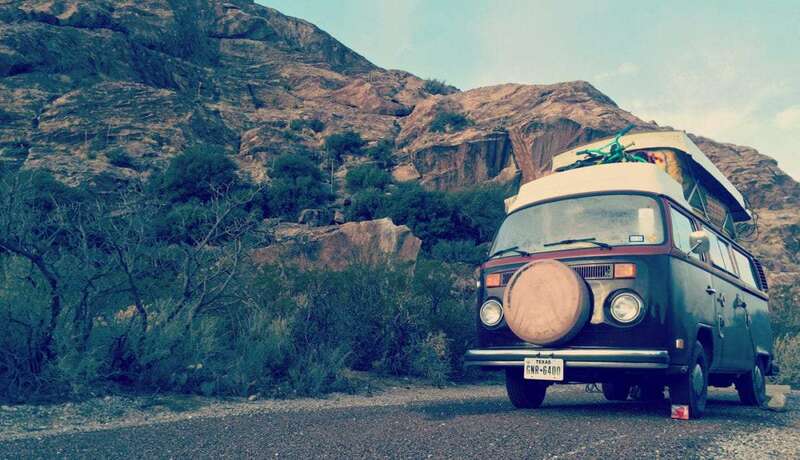 The secret to longevity in an air-cooled VW Bus is to be gentle. Let her sit idling for five minutes before you take off. 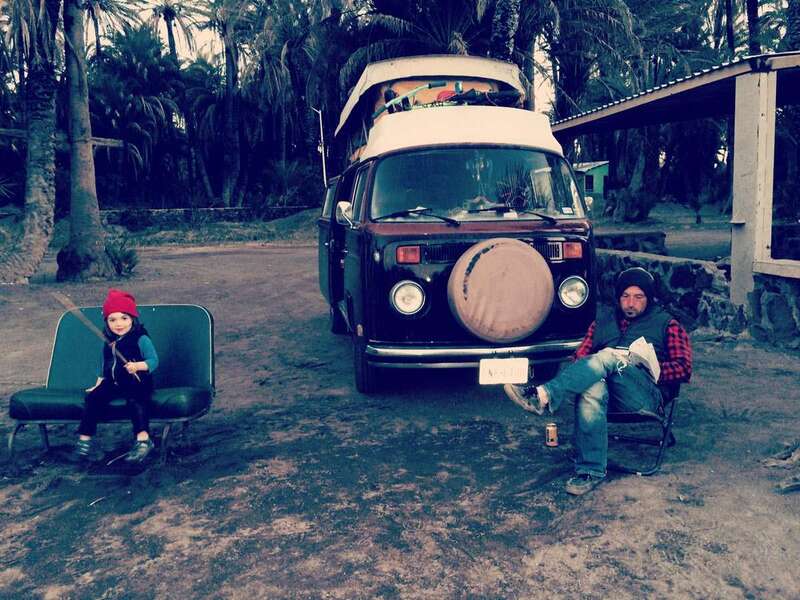 Well a Bus, even a Vanagon, is pretty old. They need a little time to lube up. I built a net to hold the boys’ bikes, an extra gas tank, a bike pump and our axe to the rooftop storage compartment, aka the attic. So five minutes goes by and, well, whatever the day may hold. We don’t drive more than 200 miles a day, about the equivalent of four hours as we top out at 60mph and can easily slow to 35 on an incline. Ideally, we don’t go more than 50 miles every few days. If we’re not going anywhere, maybe we go on a hike, look at a waterfall, study a tree or hope for an owl. At some point every day I need to work and sending Tristan off to amuse Winter while Wylder takes a nap is ideal in such circumstances. Going out to eat is common, but expensive. Making food at home means a lot of simple meals and frequent grocery shops to keep things stocked and fresh. I like that, personally. When the whataday is done, there is a couch with a hopefully smiling three year old on it watching Curious George on our iPad. 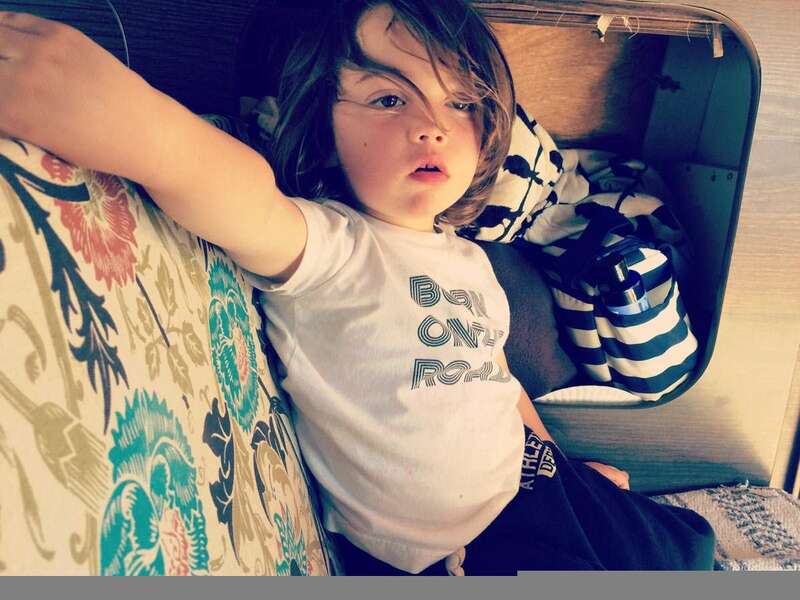 His just older brother is in the bunk above, chin on his knuckles lying on his belly and looking down from above. The teenager sits on his phone in the front seat texting and generally being a kid his age, except our living room comes with a dashboard. 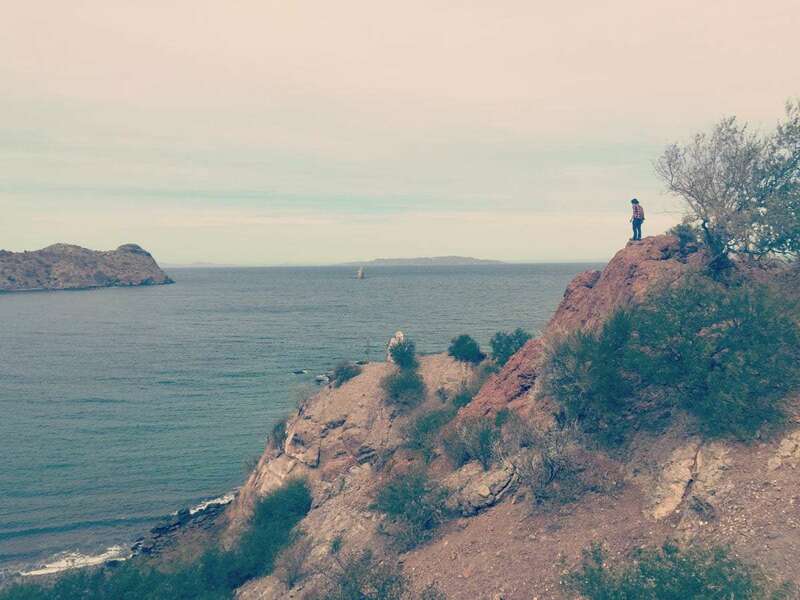 Though a teenager who loves to play on his phone, Tristan will still humor me with an afternoon hike now and again. One of the perks of this life is spending so much time with my boys. I drink a few beers, sneak a smoke outside. Maybe a fire if it’s not too chilly or catch a shooting star or two if it’s downright warm. Renée eats chocolate and joins me for a bit if putting the kids to sleep wasn’t too tempting a nod of its own. We try and stay in the most beautiful place available. Sometimes that’s a thick forest or endless open desert where you see little of society except maybe a raven tormenting a few vultures. Sometimes it’s a more formal state park, or on desperate clutches some private RV park where we loathe the close proximity of our neighbors but enjoy a plug and hot showers. When we have to pee, it’s against a tree or stealthily in a bucket that then gets dumped discreetly back into Mother Nature. 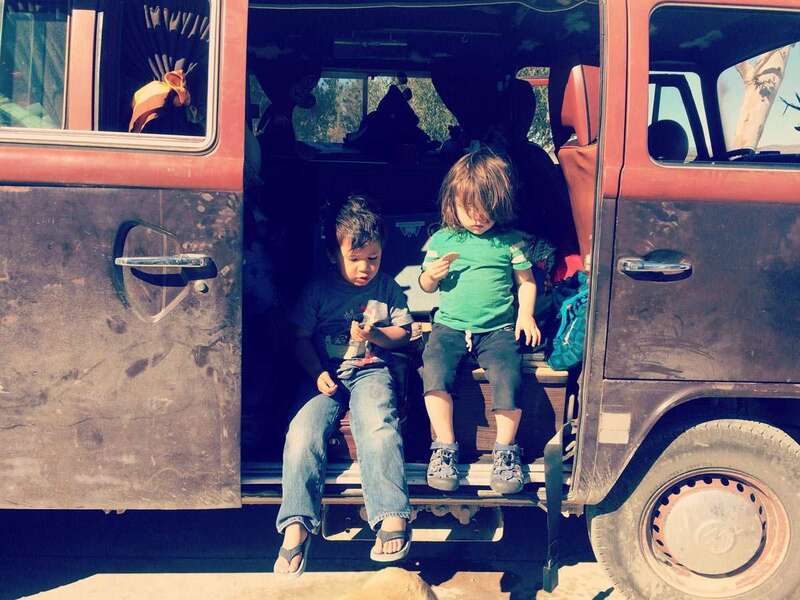 We’ve lived several lives in this old German people mover gone Oregon camper van. When I first bought it, I had already lived on the road for a year with Tristan, then only 8. We spent a snow dumping fall in the Colorado Front Range before I was able to convince Renée, the long lost love of my life from college found, to move in with us. 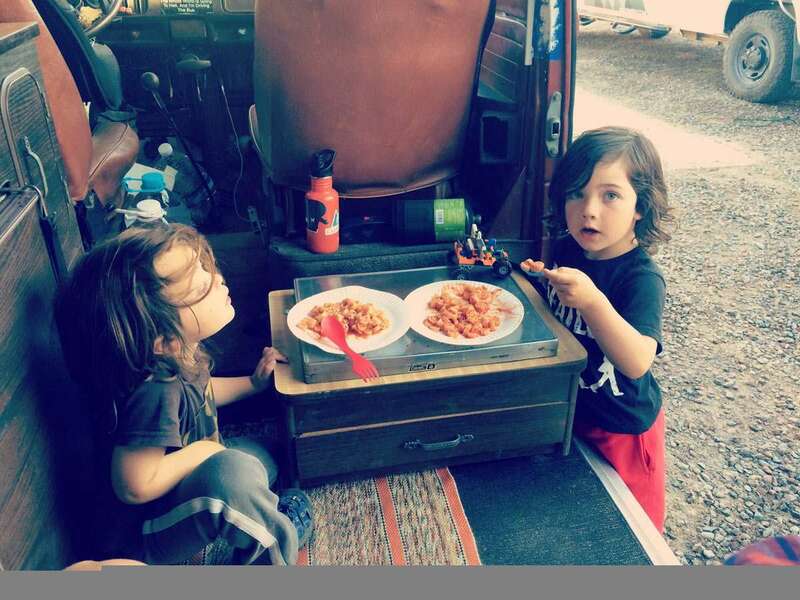 We spent a year breaking down, learning to live in a small space and travel the Southwest and Southeast of the U.S. before she and I became pregnant and we all hunkered down in a little beach house off the Oregon Coast until Winter was fully cooked. Immediately we knew we’d want one more child and figured how else best to find the place he’d be born than to drive our newborn around New England and Michigan in our Bus for a summer? 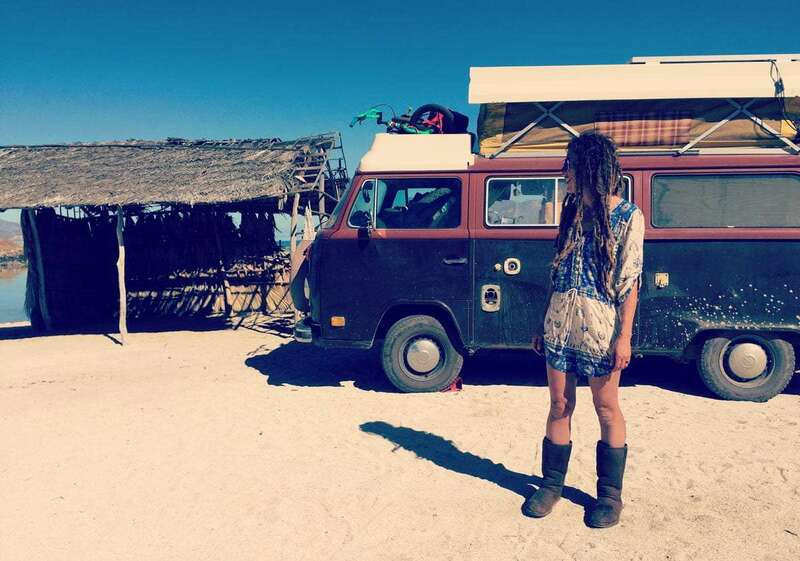 Scenes from a VW Bus: Roughing it in town. 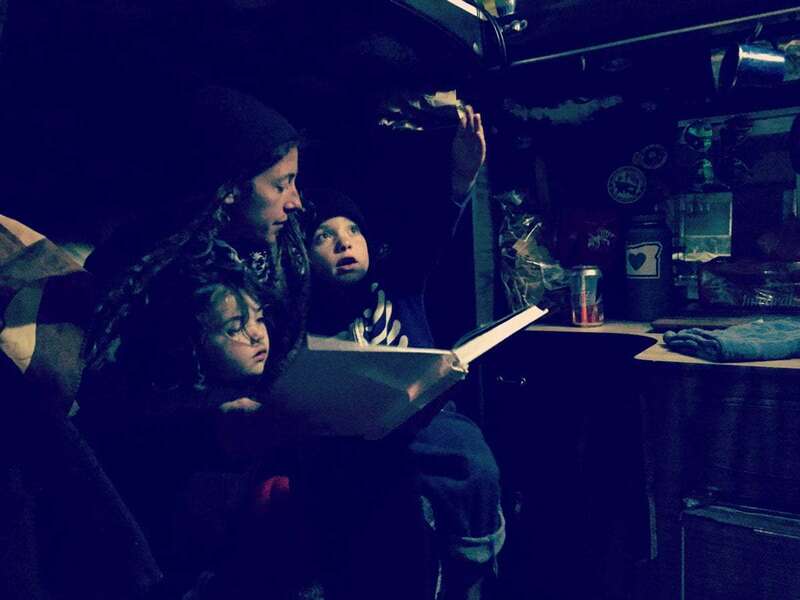 Scenes from a VW Bus: Young boys enthralled at the tales a mother reads before bed. 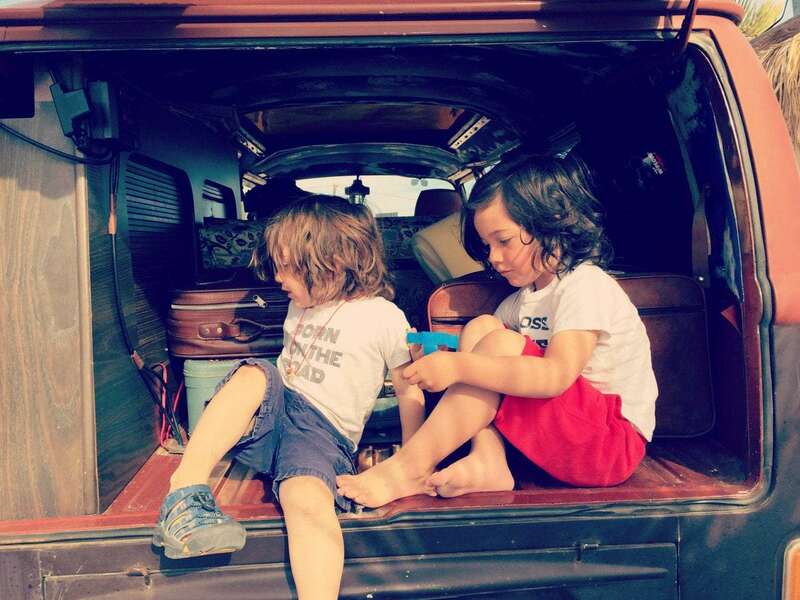 Scenes from a VW Bus: Brothers learn to play nicely on the back porch. 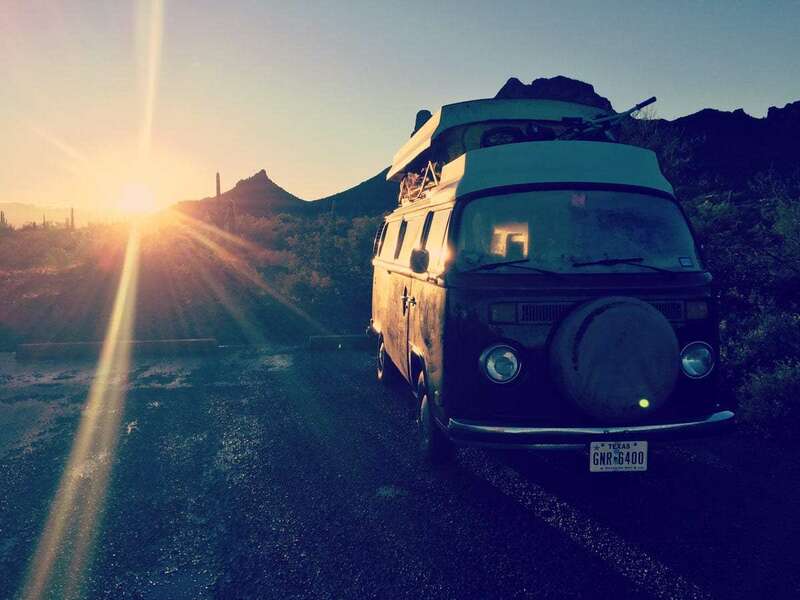 Scenes from a VW Bus: The daily grind unfolds. 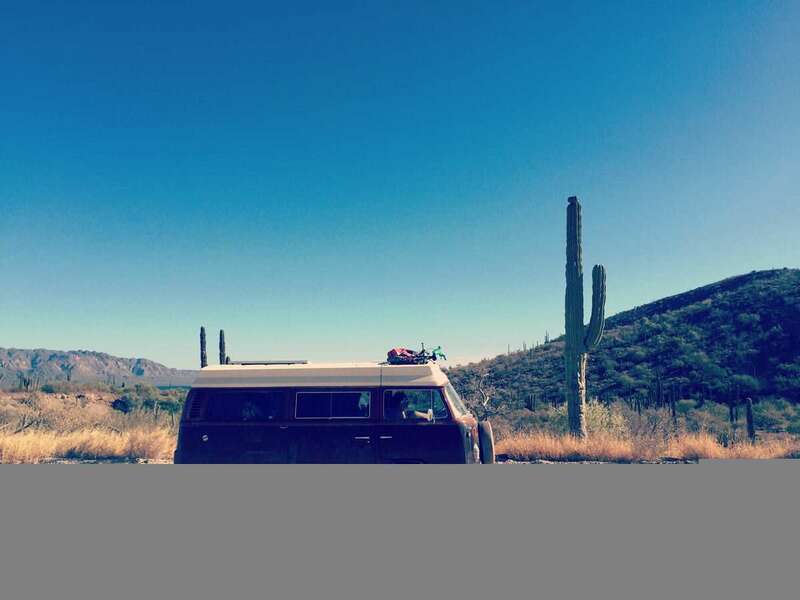 Scenes from a VW Bus: Roaming the desert. 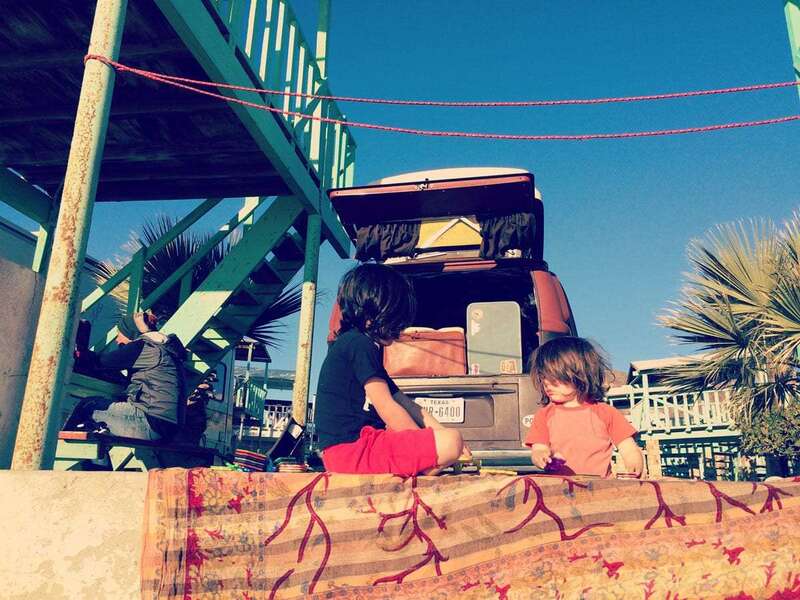 Scenes from a VW Bus: Sometimes you invite friends over to play. 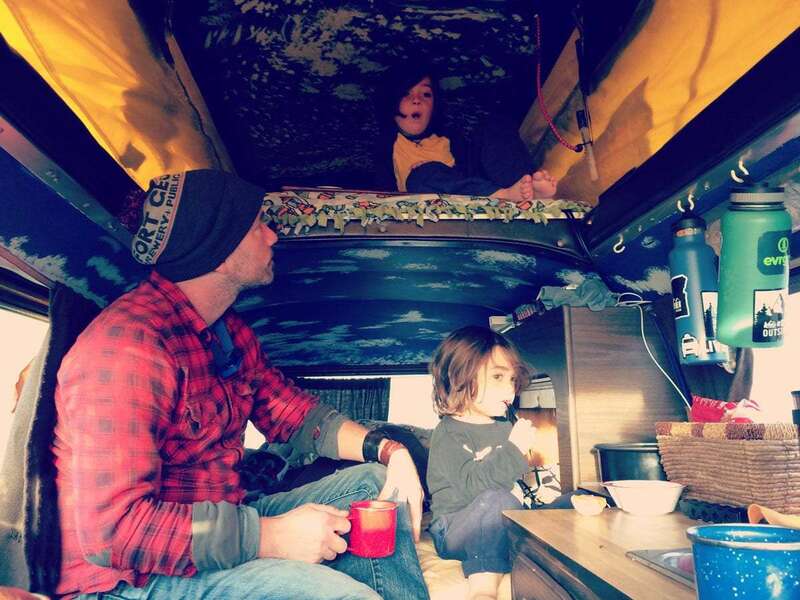 Scenes from a VW Bus: Making an additional living room alongside a river helps increase our square footage. 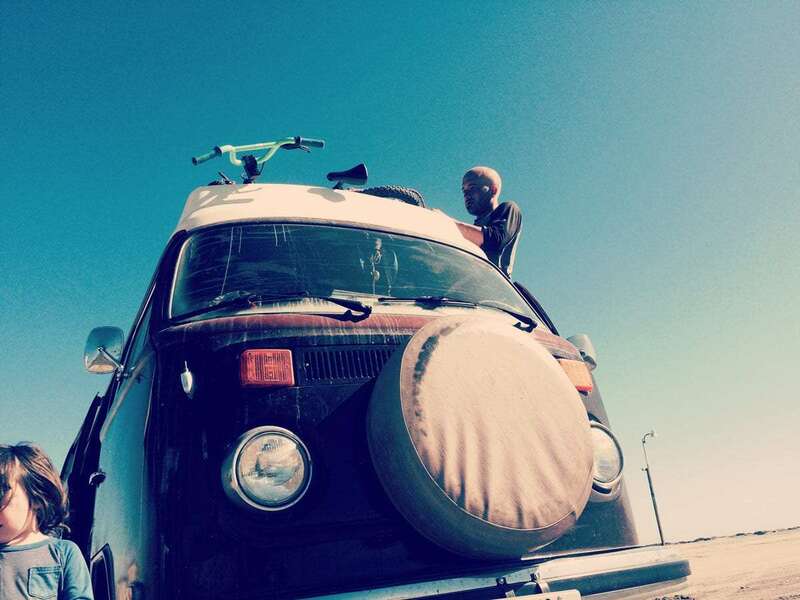 Scenes from a VW Bus: Breakdowns are simply a part of life. 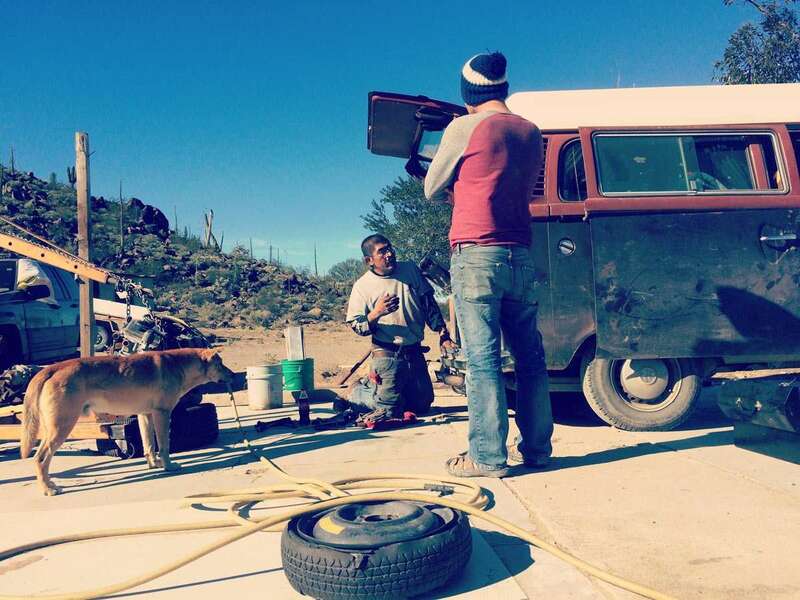 Sometimes I can handle them…and sometimes you find a tire salesman along Mexico 1 who happens to be willing to give you a tune up. 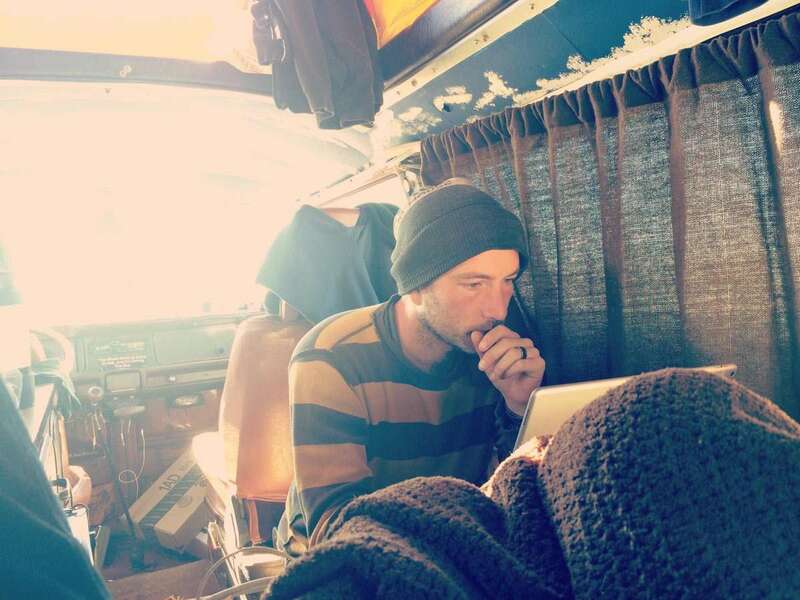 Scenes from a VW Bus: I typically work outside, when the temperatures allow. 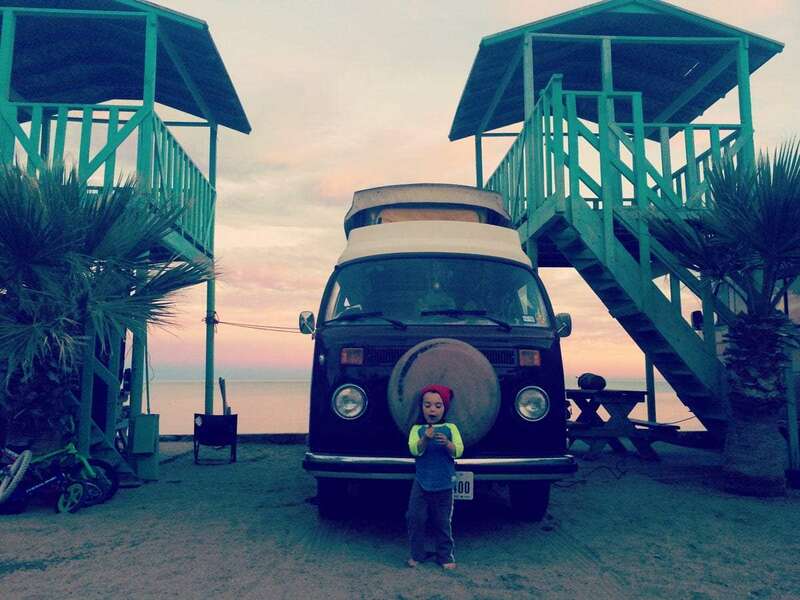 Scenes from a VW Bus: And a beautiful mama she certainly is, whether tucked away under blankets galore or basking in the sunshine of current location in Baja, Mexico. Scenes from a VW Bus: Renee, our dear Mama, from her position in the cockpit. We eventually settled on the Smokey Mountains on a weekend whim. Wylder was born and though we’d buy and live in an Airstream for our larger family’s home on the road, we’d take the old girl out for a few weeks state time to give him a taste, too. There’s just something about her. The way she feels in your hands as the captain’s wheel swings back and forth down a winding two lane road. How every other Bus owner throws the peace sign as you pass. How you become entangled in the highs of vintage lore and lows of ancient machinery malfunctioning. You learn to accept that the long line of people queuing up behind you come every mountain pass will just have to wait or take their chances passing. How it will feel to drive and sleep through both freezing winter nights and muggy summer days. How she’ll tell you when she’s done for the day, and you’ll know not to push her too many miles further for fear she may call it quits on the side of who knows where. And how come morning she’ll purr to a sputtering groan once again, like our boys, ready for a new day given ample time to cool down. 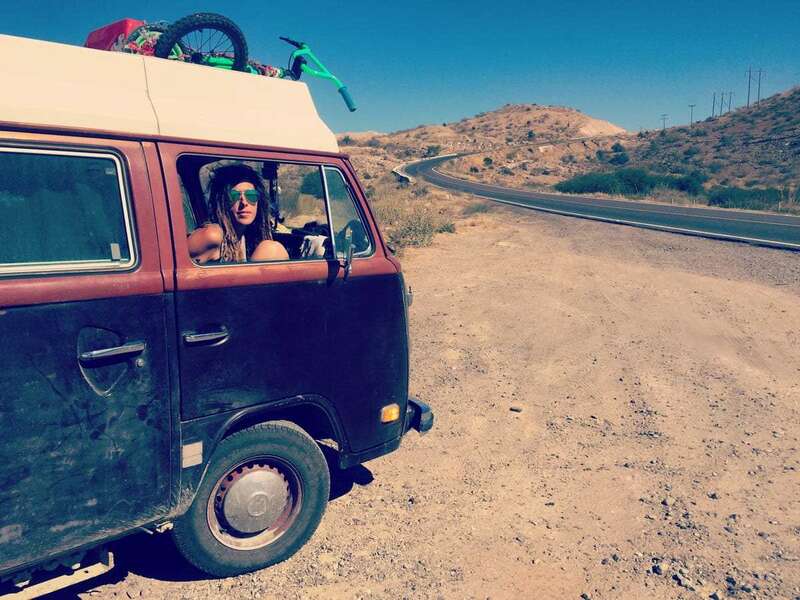 So as to exactly how we fit five people in a VW Bus, it’s exactly the way the hippies did it a generation ago, tightly knit and with a whole lotta love.